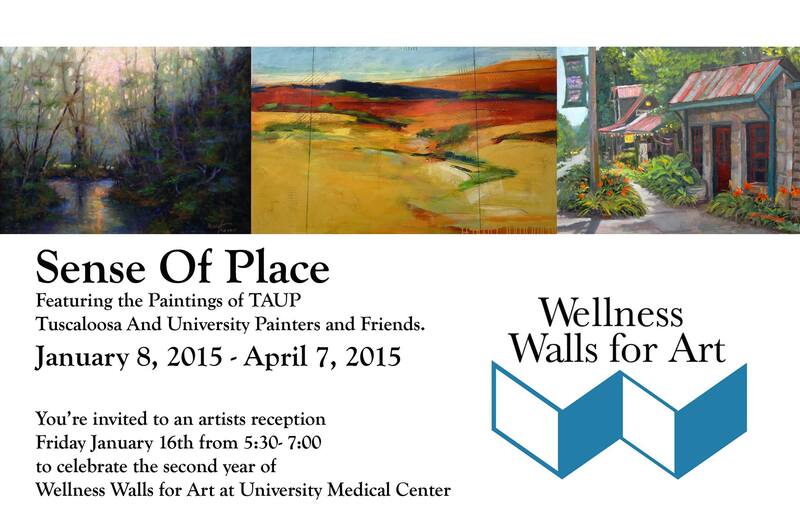 The Wellness Walls for Art program at the University Medical Center is opening the 2015-year with an exhibit that features 17 artists and is entitled A Sense of Place. The public is invited to a reception Friday, January 16 from 5:30-7:00 p.m. at the University Medical Center, 850 5th Ave East, Tuscaloosa. The exhibition will continue through April 7, 2015. Curator Deborah Hughes writes, “We all have places that evoke memories, often treasured ones, and sometimes not so treasured. A Sense of Place brings together work that is evocative of an observed, remembered, or imagined scene.” The show primarily represents works of the Tuscaloosa and University Painters, many of which were executed in the plein air tradition, painting outside on location. Meridian, Miss., based artist Cooper French has been invited as a special guest artist. Artists represented are Cooper French, Sue Blackshear, Elizabeth Hagwood, Matt Daugherty, Chris Metzger, Karen Jacobs, Diana Francko, Emily Mitchell, Anne Stickney, Lorie Layden, Jack Kidd, Jane Evers, Sandra Ray, Pamela Copeland, Lisa Godwin, Sharon Long, and Deborah Hughes. 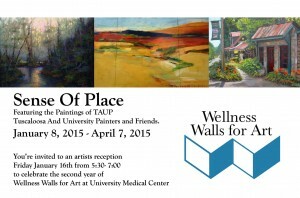 In 2013, local artist and UA art alumna Deborah Hughes took over coordinating the hanging of the art at the center and in January 2014 she became the official curator of the Wellness Walls for Art program. Last year’s shows included A Brush With Art – Paintings by The Tuscaloosa and University Painters; The Many Faces of Art in Adult Continuing Education; About People and Quilting and Carving, featuring the prints of Isadora Bullock and quilts by the West Alabama Quilters Guild. For information contact Deborah Hughes at 205 310 5939 or go to the Facebook event page: https://www.facebook.com/events/770750026306557/.